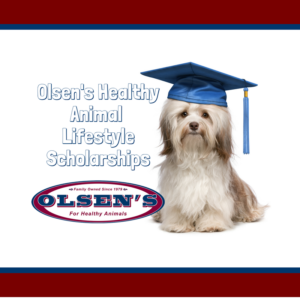 The Olsen family values the Healthy Animal Lifestyle and would like to support area High School Seniors that currently and in the future plan to include animals in their lifestyle with a one-time scholarship valued at up to $1000 each. Applicant must be a graduating senior in the Prescott quad city, Verde Valley, or Flagstaff areas. Applicant must have a GPA of 2.5 or better. Animal owner or active in the care or business of animal care. Plans for a future in animal ownership or career. Applicant will find the application at olsensgrain.com. Application must be typed or completed in Microsoft Word and printed. Responses may exceed the space provided on the original application. Neatness, grammar and spelling will be considered. Attach two (2) signed and sealed letters of recommendation. One must be from a current educator. The second one from an adult member of the community, other than a family member. Attach an original signed and officially sealed high school transcript. Obtain from counselor office. DEADLINE: Application must be postmarked by March 15, 2019. NO LATE APPLICATIONS WILL BE CONSIDERED. Scholarships will be awarded at the End of the Year Awards programs. BEFORE ANY SCHOLARSHIPS CAN BE RELEASED, PROOF OF FULL TIME ENROLLMENT MUST BE PROVIDED. THIS IS AVAILABLE THROUGH THE SCHOOL REGISTRAR’S OFFICE, USUALLY IN LATE AUGUST. If you have any questions, please contact the Olsen’s Scholarship Committee Chair by email. We look forward to awarding the 2019 Olsen’s Healthy Animal Lifestyle Scholarship to this year’s recipients!